Dark Mod environs could use more grafitti. 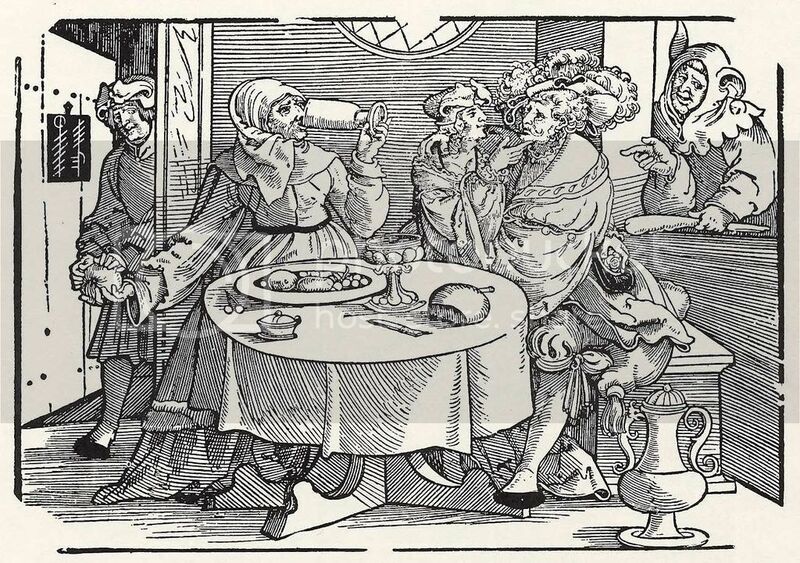 Ancient/Midieval times had plenty. What's the hold up? and blast it with contrast to make a BW image then use that for grime decals I suppose. I'll ask you the same thing. If you want it done, go do it! I do like the idea. It'd need some research or imagination. A quick google image search for medieval graffiti is mostly carvings in stone for obvious reasons, which isn't right for us. It tends to be too small scale, and anyway we'd need something that looked right as a decal on existing wall textures -- i.e. the kind of graffiti that'd been painted on, not scratched into stone. Some more old thieves'/beggars' signs. And some that are more modern. 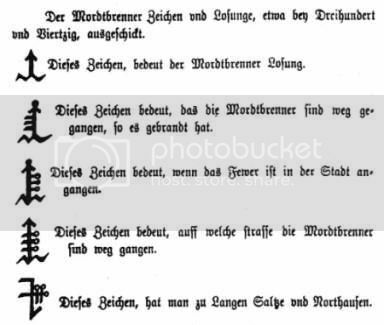 Could some kindly person please provide a translation of the earliest ones (2nd pic)? Phew, that second pic is tough. It seems to be German, but it is almost illegable due to very weird wording and general grammar. I think those signs are either related to incendiarists or murderers. 2nd sign: something like people ran away after they lit something on fire. 3rd sign: The fire broke out in the city. 4th sign: Indicates which road the incendiarist fled. 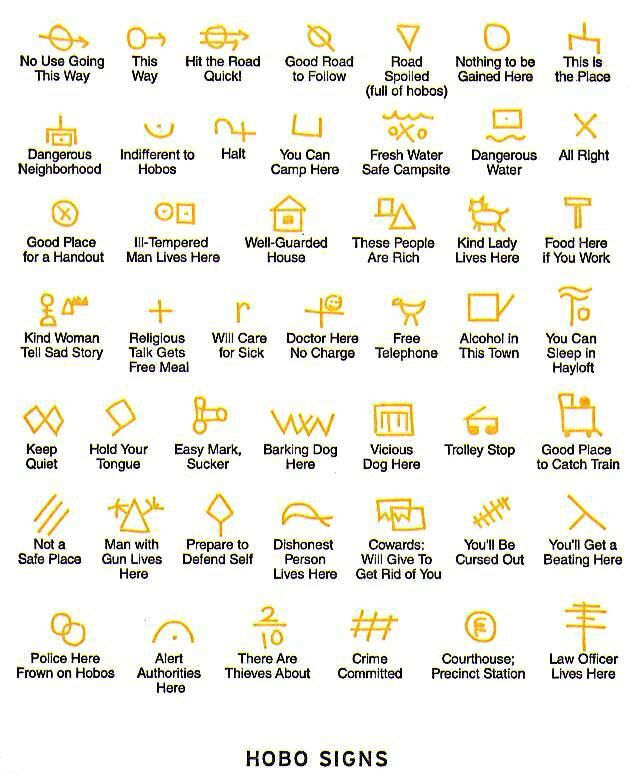 Incidently, hobo signs are not that much different from Thief's magic Glyphs. I am going to guess that modifying a bump-map into an alternate would suffice for an etching along an otherwise common texture. I dunno about anything else technically. It might be possible to have decals which only show up when specific lights are active...ie Wall in shadow due to boxes, which are illuminated with moonlight; move boxes message revealed which does not show up under lamp/candle/torch light. Oh look hidden blood-spill shows up under blacklights. I will investigate, and will stop posting demanding nonsense. I've always wondered whether anyone had found a use for "spectrum". Both the light and the surface are limited to the special spectrum, and I couldn't think of a use case. But this would work. You'd have the spectrum light in the same place as your moonlight, so they share a shadow, and it would look like it was moonlight only that could reveal the secret sign. You could put other lights around, and neither those nor your ambient light would show the secret mark. I made alphas for some of these. I'm guessing it's a pretty simple matter to make the non-alpha bit an uniform, tintable surface. Ho boy. Those are great! Nothing special needed for this use case. We just use "blend add", and they won't taint the underlying surface where they are black, but they'll add brightness where they are white, and the mapper can control the colour and brightness using the "_color" spawnarg. We just need to invert the colours (no need to change the image, it can be done in the material file) then use blend filter. The black areas of your images will do nothing; the white parts will darken the surface behind, again controllable by the "_color" spawnarg. We'd need to make them light-interacting for this case, but still be completely transparent in the black parts. We might have to fall back on alpha testing, using your images both as alpha map and diffuse map. We'd lose a bit of the detail where they fade out, but hey, it's a magic symbol and a rare/special case that'll come with some wow factor built in when the player solves the puzzle. Again we could use the "_color" spawnarg for tinting. @Springheel, I assume these are just simple decals..? and objections to me adding these to SVN..? @Steve, if Springs has no objections how would you like to move forward..? ...ok, now I'm tempted to make an actual knob grafitti texture. Obligatory flying droplets included, naturally. Now how's that for a secret symbol. The player searches for super important, super serious secrets, and the special colored light reveals... obscene doodles. As long as you put a hole in the wall right next to it. If I might add an idea, could we have some symbology that's unique to our world, and maybe a bit mystical? It doesn't have to be magical runes that open doors or anything (which seemed kind of gimmicky to me anyway), but something kind of underworldish and mysterious that gives some color to neighborhoods and an idea of other things going on around you. There are already some glowy rune decals and a pagan symbol. What we could also use as graffiti of the same style Bob posted would be arrows, an X to mark the spot, numbers (I, II, III, IIII, and IIII), the basics. I have always wanted to make them, but never got around to it. what material def should I be using for these images, do I just treat them as decals..? No rush mister, when every your ready etc.